Learning about lung cancer and its treatment can help you prepare for your appointments, understand different types of treatment, and prevent and manage any side effects. Written by experts, our easy-to-read booklets and fact sheets provide reliable information. Featured oncology social workers answer your questions about cancer-related concerns. Read answers to past questions or submit your own. 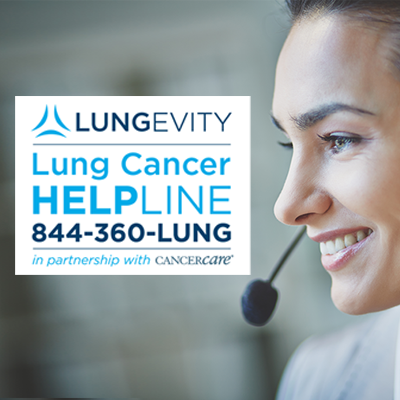 Professional oncology social workers provide free emotional and practical support for people with lung cancer, caregivers, and their loved ones. CancerCare’s staff of professional oncology social workers can help you and your loved ones cope with the emotional and practical challenges of lung cancer. Led by oncology social workers, our support groups help you connect with others affected by lung cancer to share information and experiences. CancerCare offers a variety of in-person workshops, therapeutic activities, and special events throughout the year. CancerCare has partnered with BodyMind Sessions to bring you the CancerCare Meditation app. The app aims to help people affected by cancer manage the symptoms of treatment, reduce stress and achieve better sleep.